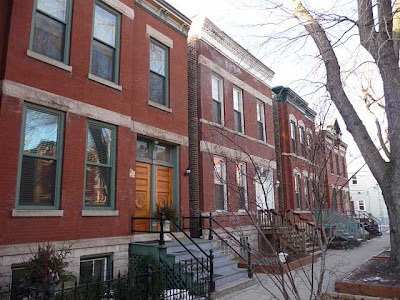 Chicago's East Village neighborhood joined the National Register of Historic Places on Dec. 8. Architect Scott Rappe, who chairs the East Village Association's planning, preservation and development committee, tells what that means in the Sun-Times last week and on WLUW (88.7 FM) in an interview scheduled to air at 10 a.m. Thursday. The radio program will be available as a podcast from producer Outside the Loop Radio. A New Year's Eve announcement describes East Village as an "Ethnic (European) Historic Settlement in the city of Chicago (1860-1930)." Its boundaries are Division Street and Chicago, Hermitage and Damen avenues. The City of Chicago created the East Village Landmark District four years ago as an example of "Chicago working-class neighborhoods developed in the late 1800s and early 1900s," in the city's description. The Illinois Historic Preservation Agency nominated the district to the National Register last year at the city's request. Tax breaks are available to homeowners who renovate properties the city has earmarked as significant. Apartment buildings on the National Register can qualify for a 20% income-tax credit.